IQALUIT, Nunavut -- James Eetoolook is a 72-year-old tuberculosis survivor among a family of survivors. He and seven of his relatives were stricken with TB, including his mother, sisters and brother, who was first diagnosed in the mid-1940s when one of the ships carrying doctors north to help Inuit reached his family's trading-post village. Eetoolook was sent to Edmonton for treatment at age 16, and was bed-ridden in hospital for months. Many more Inuit, from the 1940s to the 1960s, were sent south for treatment. Some never returned home and were buried in southern Canada. Their families were never told of their deaths, nor their final resting places. On Friday, Eetoolook and Inuit across the North affected by the federal government's actions heard an official apology from Prime Minister Justin Trudeau, who shed tears as he called their treatment colonial and misguided. Trudeau also announced the opening of a database Inuit families should soon be able to use to find the graves of loved ones who died after they were transported south for treatment. The database is part of a wider initiative called Nanilavut, which means "let's find them" in Inuktitut. Eetoolook said the apology and database will bring closure to many Inuit. "It will help the families that had loved ones that died," he predicted. "Some of the (burial grounds) will be hard to find." Tuberculosis is a bacterial infection that typically affects the lungs and can be life-threatening. It can emerge into active illness years after a person catches it. Even with modern medical care, a full recovery can take months. Trudeau acknowledged many people with TB died after being removed from their families and communities and taken on gruelling journeys south on ships, trains and aircraft. The prime minister also apologized to those who still do not know what happened to their loved ones. "To the communities that are facing the consequences of this policy and others, we are sorry," he said. "We are sorry that because of our mistakes, many Inuit don't trust the health-care system so they can't get help when they need it. We are sorry for the colonial mindset that drove the federal government's actions." The apology had been in the works for the better part of two years after Trudeau signed an Inuit-Crown partnership agreement in 2017. 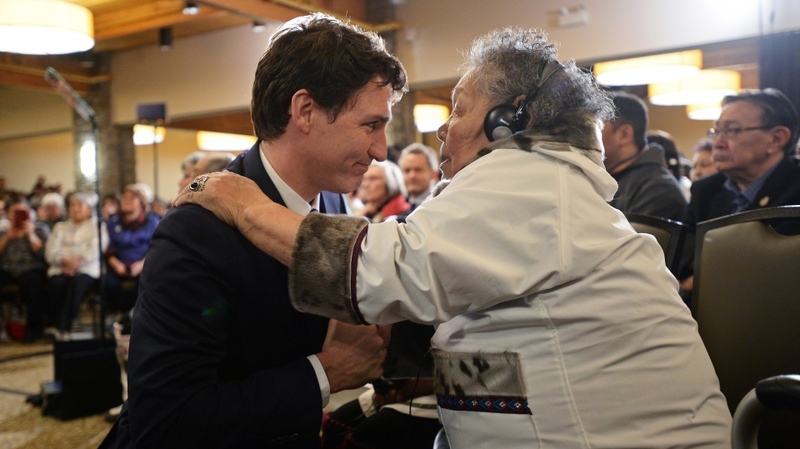 Prior to the apology, Trudeau was hugged in a long embrace by a woman who told the gathering how her husband died and his body was not returned. As Trudeau spoke, many in the room in Iqaluit's Frobisher Inn openly wept. "That's what this project is about," Trudeau said. "About finding and honouring Inuit who went missing during the TB epidemic and bringing healing and closure to everyone who was left behind." Natan Obed, president of Inuit Tapiriit Kanatami, called the government's treatment of its citizens a "massive human-rights failure. " His organization acts as the national voice of the roughly 60,000 Inuit living in four sections of northern Canada. "From the Inuit perspective, apologizing for human-rights abuses is never a bad thing," he said in an interview. "We as a country have to also accept responsibility for things that happened and know that apologies are necessary for classes of people whose human rights have been violated." Speaking after the prime minister addressed reporters, Obed lamented how little interest the issue seemed to receive from some reporters who travelled to Nunavut to cover the apology and asked Trudeau about the SNC-Lavalin affair instead. "The fact that media pass right by the people whose human-rights abuses were not told by the media for decades, to other stories of the day, is still a reflection of the work that needs to happen on reconciliation ... This story matters," he said. "It is a Canadian story and I recognize there are other media stories that matter as well, but I do hope in the future, there can be more respect given to the place and time and the people who deserve to have their story told and the media that have a strong role to play to tell it." 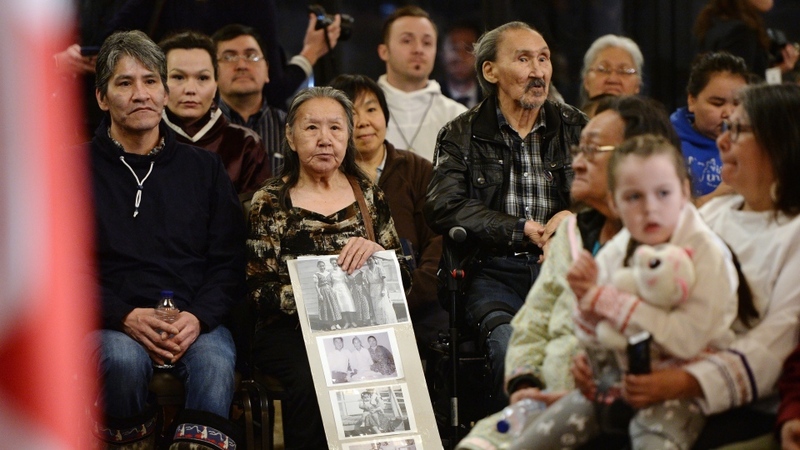 Inuit who were infected with TB in the middle of the 20th century were taken into government care, separated from their families and transported aboard ships to sanatoriums in the south of Canada, where they were disconnected from their culture and language. Nunavut Tunngavik Inc., a representative for Inuit in Nunavut, has said it wanted to help family members locate burial sites of those who died during tuberculosis treatment from the 1940s through the 1960s. Eetoolook, the organization's vice-president, said he is worried that TB is returning today. According to the most recent Public Health Agency of Canada report on the disease, the average annual rate of tuberculosis among Inuit in Canada a year ago was more than 290 times higher than Canadian born non-Indigenous people. The agency cited cramped social housing, overcrowding in homes, high smoking rates and high food prices among the main culprits. The report said progress has been made in tracing all cases of infectious TB, screening of school age children, faster diagnosis and earlier treatments, however. Trudeau reiterated Friday his government's two-year-old pledge to develop a plan to eliminate tuberculosis among Inuit. "The government has said it wants to eliminate TB by 2030," Eetoolook said. "Are they going to do it? Probably not." Trudeau talks about the gruelling journey to hospitals in the south, many were fatal. One elder I spoke to yesterday said it took him one week to get to the hospital and two weeks to get home 2 years later. It is an emotional day for Inuit. One woman just walked out crying. There are tissue boxes at the end of many aisles. Many people in the crowd have brought photos of their loved ones. Trudeau says this was a “shameful chapter in our history.” He says culture and language was eroded and “families would never again be whole.” He says Canada must carry the guilt and shame of what the government did to Inuit. Part of the apology is the announcement of the Nanilavut Initiative to help families locate and honour Inuit who went missing during the TB epidemic. There will be money for some families to visit the graves of their loved ones. Money will also be provided to mark the graves. TB is still a huge problem in the north. Inuit in Canada are about 300 times more likely to contract TB. The government and the ITK have a goal of eliminating TV across Inuit Nunangat by 2030. Trudeau says TB cannot be cured by medicine alone. Poverty, food insecurity and inadequate housing, which all contribute to the spread of TB, must be addressed.